Ecomax Plus rack conveyors are truly outstanding in their field, delivering ease of use and low running costs. Designed for higher volume operations, the machines ensure a gleaming finish without fail. We offer a full range of cutlery, glass, cup and plate racks as well as chemicals to assist you in efficiently providing highly presentable tableware. 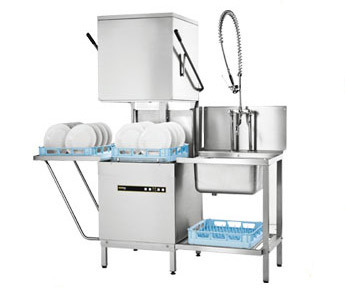 Designed specifically with small and medium volume caterers in mind and taking advantage of high quality German manufacturing processes the Ecomax product range of dish and glasswashers gives you pure efficiency at value for money prices. Industry standard manufacturing makes the Hobart Profi range a leader in the market. Filling, cycle start and draining are activated by just one button. GENIUS X2 with soil sensing removes 20-40% more food soil from the wash water allowing wash tank capacity to be reduced to just 10.8 litres. Saves up to 40% on detergent usage. ACCURINSE uses just 2.0 litres of fresh water per cycle saving up to 30% on water, energy, detergent and rinse aid costs. Clip-in wash and rinse arms allow easy removal and replacement. Interlocked strainer prevents blockages and damage to the wash system. 2 in 1 double racking increases capacity and flexibility. All the features of the Profi series plus INTENSIV4 revolutionary active drying cycle. Unique ECO programme with Vaporinse using just 1.0 litre of water per cycle – saves up to 40% on water and detergent usage. 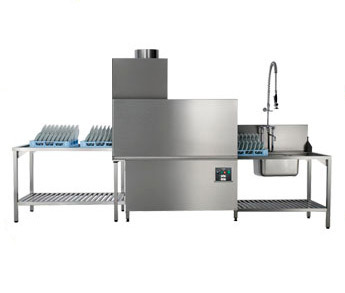 Continuous wash cycle option for baked on soiling. Cutlery cycle with steam delivers outstanding results. Hobart strives continuously to develop processes which reduce energy consumption and in turn reduce damaging CO2 emissions. By utilising advanced technologies to reduce water consumption and by utilising water more efficiently, Hobart have been able to significantly lower the energy usage. Ensure machine is at correct temperature before washing. Check detergent and rinse aid levels in bottles. Pre-rinse all glasses, cutlery and crockery. 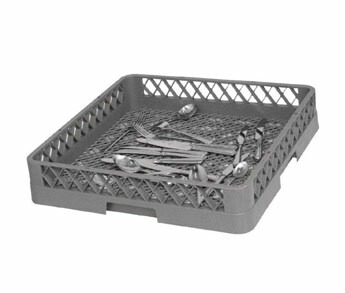 Mix cutlery in baskets. Ensure all filters are in position. Allow machine to complete full wash cycle. Water softener (if fitted) must be regenerated with salt. Damage caused to the machine by lime scale damage due to lack of water softener or incorrect regeneration of a softener is never covered by the manufacturer’s warranty. Remove and clean wash and rinse arms and jets daily. Remove and clean all filters daily. After cleaning leave door open (if safe to do so). NEVER switch machine off whilst washing/rinsing. NEVER open machine door whilst washing/rinsing. NEVER use top of machine as a work surface or to unload baskets. NEVER use cleaning agents that contain Chlorine, Bleach or Hypochlorite. NEVER use steel wool, wire brushes or any other abrasive materials. NEVER jet wash or hose pipe the appliance. Ensure sufficient space is available to accommodate machine. 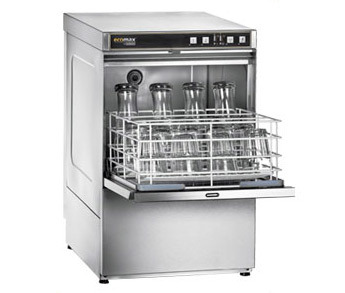 Drain pump: ensure standpipe height is below the top of a front loading glass or dishwasher. Ensure water pressure is between 1 and 4 bar. (Above 4 bar = flow restrictor required. Below 1 bar = rinse booster pump required). Always connect machine to a soft water supply. In hard water areas we recommend a water softener. Scale related problems invalidate the warranty. Ensure 3/4” BSP male threaded connection available. Ensure incoming water temperature between 4oC and no more than 55oC. Make sure the correct rated electricity supply is available. Are water, waste and electrical connections correctly made? Once connected always check that the water inlet hose is not kinked or squashed by machine being pushed against wall. 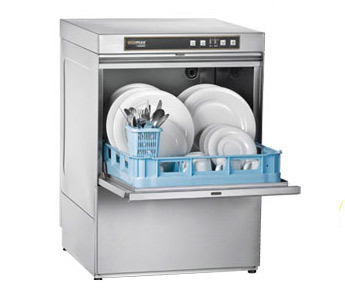 For all undercounter glass and dishwashers with a drain pump fitted, ensure waste stand pipe is below the top of machine. Have detergent and rinse aid tubes been pulled out from inside the machine and inserted into the chemical bottles? Is the detergent & rinse aid tubing clearly marked "rinse aid" and "detergent. " Have the chemicals been primed? Are wash arms, rinse arms and filters in position inside machine? Have the machine operators been instructed on how to use the machine? If machine has gravity waste is the drain plug firmly in position? Has supply voltage been tested and checked against the rating on the machine data plate? Has the warranty registration card been completed & posted to Hobart? Has the operating manual been read by operating staff? Hobart was originally founded in 1897 by Mr Clarence Charles Hobart as The Hobart Electric Manufacturing Company in Troy, Ohio, USA, initially making electric motors and subsequently electric meat choppers. As the product range expanded to include further commercial catering equipment Hobart reformed as The Hobart Manufacturing Company with Mr Hobart leaving to form Hobart Brothers Co. with his three sons in 1913. The Hobart Manufacturing Company introduced the planetary mixer in 1921, dishwashers in 1928, meat slicers & potato peelers in 1929 and opened branch offices in principle towns across America. By 1959 Hobart had crossed the Atlantic investing in the factory in Barnstaple where stainless steel fabrication is still carried out, and in September 1983 Hobart moved into their headquarters in Southgate. In 1989 Hobart acquired WM Still & Sons, manufacturers of commercial catering equipment, specialising in boiling water and tea and coffee making apparatus. In 1991 Hobart integrated with the American Premark Food Equipment Group. In 1999 Illinois Tool Works (ITW) acquired Premark Food Equipment Group with 55,000 employees in 600 businesses around the world. 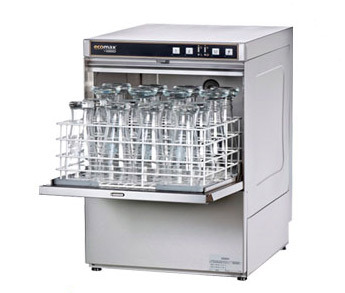 Subsiduary Hobart Independent manufactures high quality dishwasher and glasswasher equipment in Germany under the Ecomax and Bar Aid branding for wholesale through chosen distributors to the UK catering industry and we are proud to partner them in the supply of their equipment and legendary service.